Be sure not to wing it this Thanksgiving. Prepare and cook your holiday turkey right. Whether it’s your first time making the holiday meal, or you do so every year, know how to prepare and cook your turkey correctly to prevent food borne illness. Along with your roasting pan and turkey baster, the health department reminds residents that the other essential kitchen tool needed to cook a great bird is a food probe thermometer. Thaw – Allow two to three days to thaw a frozen bird in the refrigerator. Never defrost a turkey by leaving it out at room temperature. If you defrost your turkey in the microwave, cook it immediately after thawing. Prepare – Bacteria on raw poultry can contaminate your hands, utensils, and work surfaces as you prepare the turkey. After working with raw poultry, always wash your hands, and sanitize utensils and work surfaces before they touch other foods to avoid transmitting bacteria to other food. Stuff – To avoid undercooked stuffing that can cause a food borne illness, bake stuffing separately in a shallow pan, where it can quickly reach 165°F. Many food borne outbreaks have been caused by stuffed, roasted turkey. That’s because it takes a long time for heat to penetrate deep into the cavity so bacteria can survive inside the bird. Cook -Turkeys should be cooked to a minimum internal temperature of 165°F. The time required to reach this temperature will vary significantly depending on factors such as oven temperature, temperature fluctuation and turkey weight. A turkey can look done and be palatable even when cooked to lower internal temperatures. Take the turkey’s temperature to be safe: insert a probe thermometer deep into the meat. Dinner is ready when it reaches 165°F. leftover turkey within two hours and refrigerate it in shallow pans or trays with the turkey slices layered no higher than two inches. Stocks should also be cooled uncovered in shallow pans and then transferred to large covered vessels after reaching refrigerator temperature. 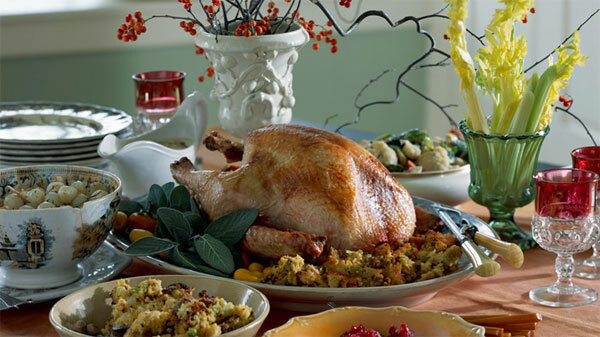 Reheat – Turkey meat, stuffing and stock should be reheated to at least 165°F when serving leftovers. The stock can be brought to boiling to ensure adequate reheating; its culinary quality will not be affected. For more information about safe food preparation, contact the Westchester County Department of Health at (914) 813-5000 or visit www.westchestergov.com/health. You can also like us on Facebook at www.facebook.com/wchealthdept and follow us on Twitter @wchealthdept.